My local liquor store happens to be one store down from the pet store I go to on a weekly basis to get dog treats and dog food for my pups. Every time I go to get dog treats I stop by and see if they put a new bottle of Angels Envy on the shelf. I’m not sure if they only get a bottle a week, or if they just put them out one at a time to keep the suspense up, but whenever I see a bottle, I buy it. Why? 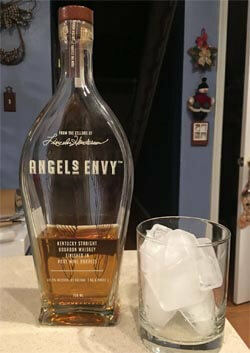 Because Angels Envy is everything a whisky should be. It starts with a little bite that quickly turns to velvet on your tongue that hints of cherries, spices, and everything nice. I’ve down three bottles over the last year. This is my current bottle. If you have bottle 916 or 918 from batch 63F I’d love to know where you are. I’m curious to see how far and wide my bottle brothers are. In terms of overall ranking, Angels Envy is a solid 90/100. It is by far the best whiskey I’ve tried so far and that quarter of a bottle I have left isn’t going to survive the weekend. Hopefully when I go to get more dog biscuits this Saturday there will be another bottle sitting on the shelf so I can treat myself to an early Kmiss present. Easy drinking with a rich mouth feel. Amazing hints of sweet, dark cherries. Tastes like it is worth every penny you paid for it.